Make party planning easy for any special occasion or event. Choose Rosemary Grill Catering for a delicious Mediterranean meal at a great value! Rosemary Grill is here to serve your catering needs whether it’s a small office meeting, large corporate party or a family gathering. For more information, you can call or email us. Please make sure to place your order at least 24 hours before your event. If there is an emergency event and you need your order on the same day please call us at (310) 826-3111. Two choices of Shawarma, Gyro, Chicken Kebab or Beef Koobideh Kebab and one choice of Hummus or Falafel. Served with Rice, Salad, Garlic Sauce, Hot Sauce and Pita Bread. 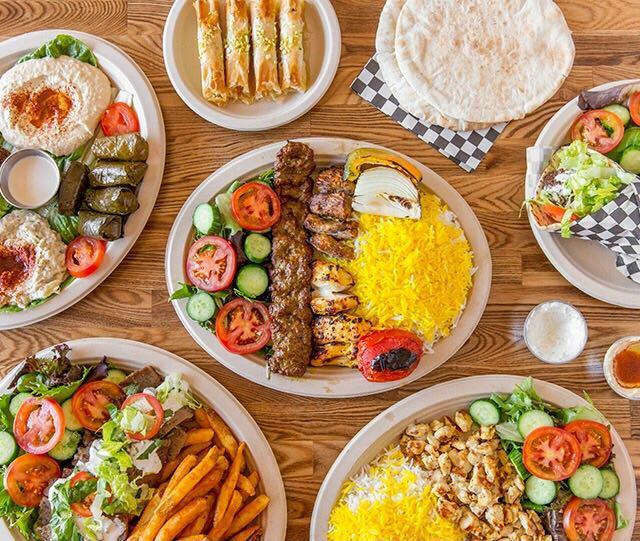 Three choices of Shawarma, Gyro, Chicken Kebab, Beef Koobideh, Salmon or shish Kebab and Two choices of Hummus, Falafel or Mast-o- Khiar. Served with Rice, Salad, Garlic Sauce, Hot Sauce and Pita Bread. Three choices of wraps shawarma, Gyro, chicken Kebab or Beef Koobideh Kebab and one choice of Falafel or Hummus. Served with Garlic Sauce, Hot Sauce Salad, Fries, or half Salad half Fires.